Creating a baby registry is a daunting task. Who knew that such a tiny person needs so much stuff? I remember hearing about ladies in the 50′s who used dresser drawers as makeshift cribs – what would they think of heirloom cribs, gliders, wipe warmers? Times have certainly changed. As a first time mom, I made the quintessential rookie mistake – I put too much stuff on my registry. Some worked out, and some didn’t. Here are my hits and misses! These things are as awesome as everyone says. 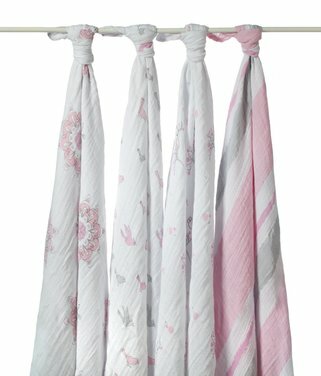 Not just for swaddling, they make great car seat covers, floor covers for tummy time, and even emergency burp clothes. We don’t use them quite as much, now that my daughter Seraphina (S) is older, but they still come in handy – I always carry one in my diaper bag. 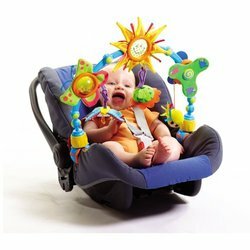 S was actually great in the car seat, but during long car trips, this thing was a life saver. She stared at it as a wee babe, and then started playing with the toys as she got older. As an almost nine month old, she still plays with it. S loves this thing. She loved the black and white pattern on his wings when she was small, and she continues to chew on him and is mesmerized by the different kinds of fabric on his body. We actually have two Jacques, after one of them had a run-in with our weirdo, stuffed animal eating cat and lost part of his face. S loves him, beak or no! S started on solids at 5 months. She insisted on putting the spoon in her mouth by herself, a habit she continues to this day. It’s great for her development, and I’m proud of my independent gal, but it means that meal time is an absolute mess. Regular bibs never worked, and we ruined quite a few outfits from those pesky avocado stains. 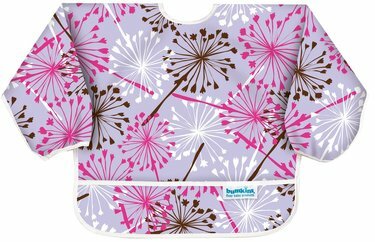 But – this bib rocks! It not only prevents food from getting on her chest, but also keeps food from getting on her sleeves. After she eats, we hose it down and let it dry before the next meal. In short, S hated this. 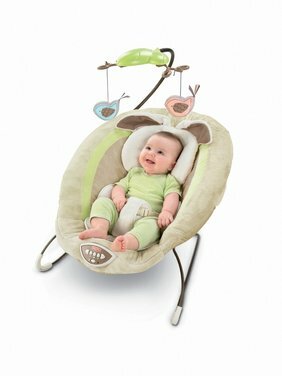 I’ve heard that some babies are swing babies and some are bouncer babies. S loved her swing (most of the time), but never liked the bouncer. I would recommend waiting until your little one is born and borrowing a bouncer and/or swing from a friend and see what he or she prefers. Trust me – the baby gear will consume your life if you let it! The less you have, the better. We tried them all for our super fussy baby. Turns out she had a milk protein allergy – once she was on the correct formula, the fussiness disappeared. Some people swear by them, but homeopathic medicines can be hit or miss. Best not to buy these until your little one is here. A registry favorite. Touts itself as a sleeper (which can be placed beside mom and dad’s bed) and is supposed to help with reflux (which S had pretty severely). 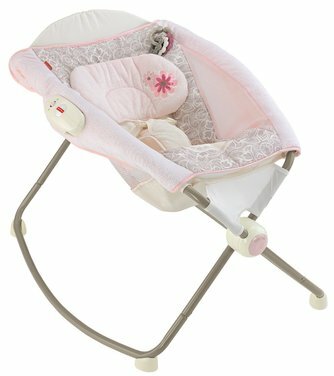 I was never super comfortable with her sleeping in it – it didn’t seem as safe as a traditional bassinet or co-sleeper. Plus, her reflux? This didn’t help it at all. We ended up using it for some downstairs naps, so not a good investment for us! I know. I was determined to breastfeed. And, despite what some breastfeeding advocates say, some people are incapable of it. Physically incapable (insufficient glandular tissue, in my case). My daughter lost 11% of her body weight within 3 days of birth and was almost hospitalized. Luckily, I had an incredibly supportive pediatrician and lactation consultant that we were real and honest with me – it doesn’t work out for everyone (though I did continue to pump – less than a ounce total a day – to give her what I could). I was truly devastated at first, and thinking of all of the breastfeeding supplies my friends and family had purchased made me feel even worse. I’m not saying you shouldn’t register for any breastfeeding supplies, but maybe not the whole she-bang (nursing covers and the like).